One of the best parts aboot Halloween is the dressing up as silly/scary as you want; bag in hand; and say three simple words to all of your neighbors for free candy. Yup, Trick or Treating. Growing up, and then as the kids were growing up, Trick or Treat time ALWAYS came on Halloween evening. 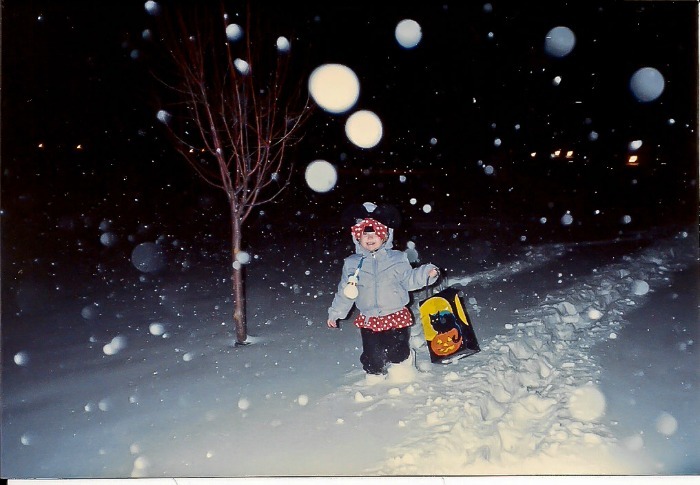 Even in 1991 when the blizzard hit in Minnesota, Trick or Treating was done on that snowy, Halloween night. It seems that the children of Milwaukee are not capable of handling such a task. Therefore, the city (and surrounding communities) schedule Trick or Treating the weekend before. Yup. Depending on your zone, you may be dressing up Friday evening, or Saturday evening, or Sunday afternoon and I haven’t heard yet if anyone DOES Trick or Treat on the actual holiday. Friday evening was Milwaukee so Oz and I tooled three blocks north and hit up our friend Mo for candy and wine. I sat with her for a portion of the two hour scheduled time and the kids had a blast, almost AS IF it were Halloween. The next night, as we were getting ready for the annual Milwookiee Halloween party, some kids came to the door for candy. But WAIT! Our scheduled time wasn’t until Sunday afternoon so we didn’t have candy yet! Poor kids, we were unprepared. See, it seems that in our neighborhood, the homeowner’s association Trick or Treats on Saturday night (but I didn’t catch the times.) But we’re not part of the association. It’s so confusing! Finally, Sunday from 1-4pm, it was OUR time. I have to say, Trick or Treating in the middle of the afternoon (during football no less) doesn’t feel the same. Oh sure, there were lots of cute costumes and children were excited. But it wasn’t the same. Many people don’t even participate and who can blame them. It’s Sunday afternoon godsakes! Maybe next year we’ll venture back to Minnesota and trick or treat with the rest of the country. Unless it snows. On another note, sending strong thoughts to all of our friends out east. Especially the South Brooklyn Weigtlifting Club folks. Be safe. This entry was posted in Uncategorized and tagged barbells, Halloween, Milwaukee, strength training, trick or treat, Wauwatosa. Bookmark the permalink.